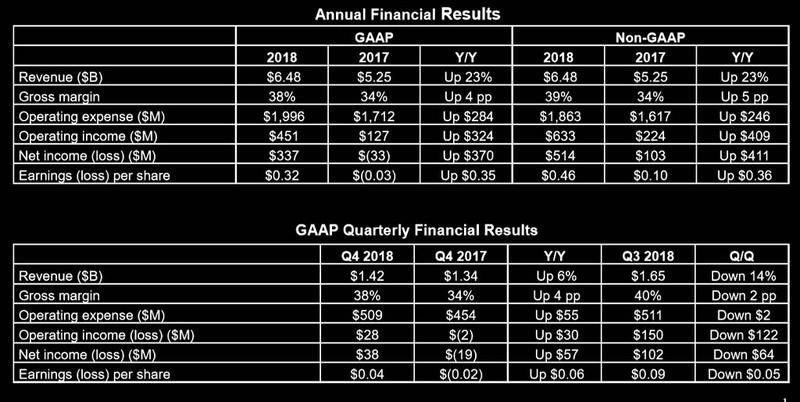 AMD today announced revenue for fiscal year 2018 of $6.48 billion, operating income of $451 million, net income of $337 million and diluted earnings per share of $0.32. On a non-GAAP(1) basis, operating income was $633 million, net income was $514 million and diluted earnings per share was $0.46. For the fourth quarter of 2018, the Company reported revenue of $1.42 billion, operating income of $28 million, net income of $38 million and diluted earnings per share of $0.04. On a non-GAAP(1) basis, operating income was $109 million, net income was $87 million and diluted earnings per share was $0.08.